There are 22 lots in this neighborhood development ranging in size from one to three acres. “We’ve experienced steady growth over the past 12 years which we believe is a result of our commitment of financial and human resources to upgrade the amenities, services and ambiance of this resort community,” said Sperling. 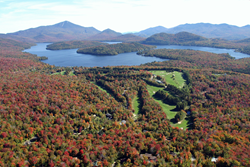 Mark Sperling, General Manager of the Whiteface Club Companies, in Lake Placid, N.Y., has announced the start of the Whiteface Club and Resort’s e xpansion into its premium Forest Brook Estates sub-division. The announcement comes on the heels of the Whiteface Club’s inclusion in Country Living magazine as one of 51 photos that prove America truly is beautiful. It is not only one of the publication’s 51 highlighted locations nationwide, but also drew the cover position for the feature section. The Whiteface Club is sister property to the AAA Four Diamond Mirror Lake Inn Resort and Spa, also in Lake Placid. The first phase of development is the installation of its infrastructure which ultimately will include municipal water, sewer, cable television and internet, and underground electrical services at each residence. There are 22 lots in this neighborhood development ranging in size from one to three acres. Each provides panoramic views of the Southern Range of the Adirondack Mountains as well as the Club’s historic championship golf course. Three lots have been sold and two custom homes have been designed for new home owners with construction now underway. Currently the Whiteface Club and Resort features an 18-hole golf course, tennis center with six clay courts, waterfront complete with marina, cross country ski trails in the winter and two restaurants including the seasonal Moose Lodge Boathouse Restaurant which is located on the shores of Lake Placid providing panoramic views of the lake and Whiteface, the Olympic Mountain. Each home owner is provided a full slate of services including lawn care, snow removal, garbage service and cold weather checks when homes are unoccupied as well as membership to the Club. The Whiteface Club and Resort, originating as the Westside Hotel in 1881 and renamed the Whiteface Inn in 1891, has been continually serving the public since that time making it the oldest and longest operating resort in the Adirondacks. The evolution of the property from its historical seasonal use as a hotel, to a year-round resort community, began in 1980 with the demolition of the Whiteface Inn and the construction of condominiums. Custom design homes are now being built in various neighborhood sub-divisions providing a range of home owner opportunities. “While we still have a number of available custom home opportunities available, there is a finite number available through the building rights provided by a variety of permits issued by the Adirondack Park Agency and the Town of North Elba,” concluded Sperling. More information can be obtained by directly contacting Mark Sperling at (518) 523-2551, or by visiting its web site, http://www.whitefaceclubresort.com.